The First World war started on August 2nd, 1914. The First World war started after the Austro-Hungarian attack on Serbia, only one month after the assassination of the Austro-Hungarian heir to the throne Franz Ferdinand in Sarajevo, who was killed by a Serbian patriot Gavrilo Princip, member of the organization "Young Bosnia". The union of the Central Forces, created in 1882 (Germany, Austro-Hungary and Italy and later in 1915 joined by Turkey, Bulgaria), took part in the war just to take control of the world markets. The second one called Antanta, created in 1907 (France, Great Britain, Russia and after 1915, USA, Japan) took part in the war not to lose the control of world markets, colonies. The interest of the two unions were heading to the Balkan Peninsula, where the front line was opened on the Austro-Hungarian - Serbian border at the rivers Danube and Drina. Here the sudden Bulgarian attack on the Serbian south (then Vardar part of Macedonia was occupied by Serbia, was Serbian south), on October 14th 1915, helped the Austrian-Hungarian empire to occupy Serbia. As the war started, Serbia forced around 53,000 Macedonians from the Vardar Macedonia, to fight for the Serb interests in this war. Many of them deserted from the army and many of them surrender to the Austrian-Hungarian army and later over Romania to be taken to Bulgaria to fight for Bulgarian causes. The Bulgarian attack on Serbia, on October 14th, 1915, was only because great Bulgarian interests, because the Central Forces promised that, after they'll occupy Serbia, they will give to it entire Macedonia and eastern Serbia. Bulgaria, forced to join it's army around 33,000 most of them from the occupied Pirin Macedonia, since 1913. From all of them the Bulgarian army created the well known, 11th Macedonian Division. A big number of Macedonians were forced to take part in the terrorist actions leaded by Todor Aleksandrov. One of his great routes represents when in April 1915, where in the Valandovo region they tried to cut the railway Skopje-Solun (Salonica) and on their way back they kidnapped 5,500 peasants from the region Valandovo-Strumica. While, in Greece the Macedonians from the Aegean Macedonia, shared the same destiny, around 20,000 were forced to fight for the Greek army. 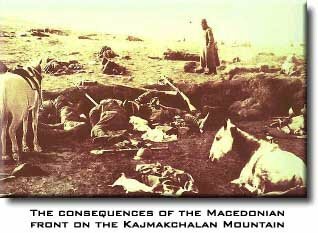 This war was self-destructing for the Macedonian nation, they fought against themselves, for foreign interests. At the beginning of the 1st World War, the Macedonian strugglers for independence of Macedonia - the members of the left part of IMRO, lead the Jane Sandanski, started to several tries and steps to stop the Bulgarian imperialists to start a new war in Macedonia. Jane Sandanski and his colleagues - Macedonian revolutionaries, in the autumn, winter and spring 1914-1915 on a several meetings decided an organized assassination on the Bulgarian ruler Ferdinand Koburshki. So to realize their ideals, the group of revolutionaries hoped to get support from many political parties and progressive forces in Bulgaria. But, soon they realized that nobody in Bulgaria supports that ideals. In a mean time the authorities discovered about the activities of the Macedonian revolutionaries, leaded by Jane Sandanski and proclaimed them to be killed or imprisoned. On April 22nd 1915, by strict order of the ruler Ferdinand Koburshki, Jane Sandanski was brutally killed. That's how the Bulgarians "made revenge" to the Tzar of Pirin, who was struggling for independence of Macedonia, which was divided by Serbia, Greece and Bulgaria. After the Dardanelle expedition, at the end of 1915 the forces of the allies were transferred to Solun (Salonica). Later here was transferred, the reorganized Serbian army and in the spring 1916 was created a new military front on the Balkans, known as the Macedonian Front (1916-1918), situated from the Gulf of Orfano to Ohrid lake and Jablanica mountain. On the north side of the front line were situated the armies of the Central Forces (Austro-Hungarian, German, Bulgarian and Turkish) and on the south side of the front line the armies of the Antanta (Italian, French, Serbian, English, Greek). 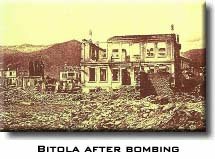 In the autumn 1916, the armies of the Antanta occupied Bitola, which had around 28,000 citizens before the war and during the war period had less than 5,000... In the next two years, the line of the Macedonian Front, which passed almost exactly by the line of the present Macedonian-Greek border, it wasn't changed at all. 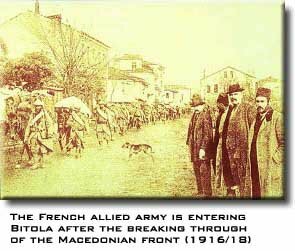 In September 1918, under the armies of the Antanta, leaded by the French General Flansh d'Epere, successfully defeated the armies of the Central Forces and soon Macedonia was reoccupied. Soon the war gets it's finish on November 11th 1918, by the fall of Germany. The front line that passed exactly through central Macedonia region represents a reason for many destroyed cities and villages by the front line, like Dojran (which today has two settlements Old: destroyed during the war and New: where the citizens moved during the war), Gevgelija and Kukuš, were ruined completely and not to mention Petrič, Ohrid, Sandanski, Prilep, Voden, Kruševo, Gravena, Lerin and others. Many people were brutally killed during the war, while others moved to live in other European countries or America and Australia, where even today many Macedonians live. During the First World War, again in the international relationships the "Macedonian Question", became active and equally interested both the Central forces and the Antanta. Beside, their interest in this, their didn't care about the existence of the Macedonians in Serbia, Bulgaria and Greece. The interest were striking in Macedonia, in the Balkans. Germany and Austro-Hungary, wanted to rule with the entire Balkans peninsula, including Macedonia and to establish a connection with Turkey and later to take over the control of English and French colonies in the Mediterranean. On the opposite, England and France wanted the keep their colonies and tried to control the Balkans so they can stop the Austro-Hungarian influence. And all routes to the middle East lead through Macedonia. The Central Forces offered Bulgaria, entire Vardar Macedonia & South-eastern Serbia. The same deal was offered to Bulgaria from the Antanta Union. But Bulgaria decided to enter the Union of the Central Forces. France on it's economic plans, wanted autonomous Macedonia in it's ethnic-geographical borders (68,451 sq km), as a base of French political expansion in the Balkans. The Macedonian emigration in the foreign European countries, organized by political organizations, associations, raised it's voice. The emigration by letters, apels, memorandums and other acts, made converts to the international public and the Peace Conference and later to the companion of the nations. All they wanted, this institutions the get to know, the Macedonian situation and the condition of the Macedonian nation, seeking solving of the Macedonian Question. And all that the Macedonians wanted independent country, Macedonia in it's ethnical-geographical borders. The most active were the Macedonian intellectuals in Switzerland, who created their own companions in Geneva, Lausanne and Zurich. On the December, 5th 1918 the companions were united in the Main Board of the Macedonian Companions in Switzerland, lead by Atanas Kocarev from Ohrid, Petar Zdravev from Tetovo, Dimitar Nestorov from Struga, Blagoj Tošanov from Stip, Trifun Grekov from Enidze-Vardar, B. Bojadziev from Lerin (Florina, Greece). In Bulgaria the Macedonian emigration leaded by Dimo Hadzi Dimov, a revolutionary from the region of Serez (Aegean Macedonia, today Greece). In October 1918, he published "The Declaration for Solving of the Macedonian Question", seeking for autonomous ethnical-geographical Macedonia, in the borders of the Balkans democratic federation. 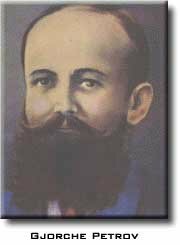 Gjorche Petrov was trying to destroy the Greater Bulgarian plans for Macedonia and creation of independent Macedonian state (ethnical-geographical), under international protection. In Russia, organized by the Macedonia colony in Petrograd, leaded by Krste Petkov Misirkov, in 1917 formed a Macedonian revolutionary committee. The committee proclaimed for Balkans Democatric Federation in which Macedonia will be independent (ethnical-geographical), will have government, assembly... On January, 19th 1919, the Macedonian emigration in Turkey, organized a meeting in Carigrad (Istanbul). The Peace conference started on in the castle in Versailles on 28th January 1919 and lasted until 28th July 1919. The Macedonian Question was actual again. But the governments of Serbia, Greece and Bulgaria, that divided Macedonia, only wanted the division of Macedonia to be confirmed. In a word the question was seen as a minority problem in Serbia, Greece and Bulgaria.